If you’ve got kids, the classic nursery song “Five Little Monkeys Jumping on the Bed” probably rings true. For kids, furniture often serves first as jungle gym. Because children are sized much differently than adults and are generally harder on furniture, different standards for safety and design apply to children’s furnishings. It’s not as simple as just micro-sizing a mattress. But have no fear: Our Children’s Furniture Buying Guide will help you keep all your little monkeys from falling off the bed (or sofa, or chair, or dresser, etc.) and allow your own creativity—and theirs—to run wild! We love a good bargain, but children’s furniture is one purchase area where buying new can be well worth paying a little extra. Used products may not show the actual wear and tear they’ve incurred, which could lead to safety issues for your children. Additionally, it can take years for recalled products to be completely removed from the market. Buying used, you may inadvertently bring a recalled item into your home. If you do buy anything used, be sure to check the Consumer Products Safety Commission (CPSC) site to make sure it is not on a recall list. You should also thoroughly clean and inspect any used items before giving them to your children. Every parent welcomes efficiency—especially if your children outnumber you. One of the best aspects of children’s furniture is that it can often serve more than one purpose. When shopping for your kids’ furniture, consider how it can work a double shift. Kids should be age 6 or older before sleeping on the top bunk. Guardrails should be placed on both sides of the top bunk, as children have been known to fall between the wall and the bunk when no rail is present. 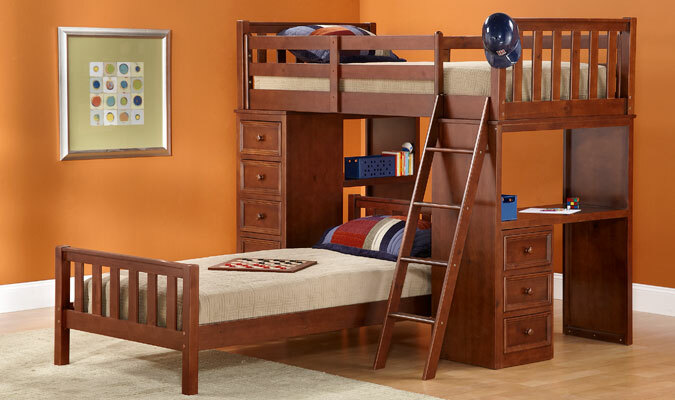 Be sure your room and the height of the beds allows for at least three feet between the ceiling and the top bunk. Ever notice how kids come with a ton of stuff? (And we hate to break it to you, but you’ll likely be storing that stuff long after they’ve left the nest.) When planning your child’s room, consider how you can save space, keep things organized, and even accommodate an extra guest. Here are few ideas to get you started. Storage beds with drawers built into the frame are an ideal way to store clothes and/or toys. Trundle beds make sleepovers more comfortable (and help you avoid running playmates home in the middle of the night because they can’t fall asleep on the floor). Dressers can serve as changing tables during infancy (just add a changing pad) and transition to storing kids’ clothes. Every door in a room can handle a little extra stuff with handy over-the-door storage solutions. Look for hanging shoe racks, baskets and pocket holders to help organize toys. craft supplies, hair ornaments and more. For fun, you can also attach corkboard to the insides of closet doors and tack reminders (“Don’t forget socks!”) or words of encouragement. Bookcases don’t have to be limited to books—add a few decorative baskets and use them to hold toys or smaller clothing items like socks and mittens. Coat racks take up very little space and keep clothes off the floor. A kid’s first job is to come into his or her own—to explore interests, pursue activities, discover an identity and share it with the world. And as you may have been told, that’s awfully difficult to do when sharing a bedroom or playroom with a sibling. But it doesn’t take much to make each child feel special in a shared room. Let them pick out their own bedroom furniture—even if one picks a brown bed andone picks white. It’s easy to tie an eclectic room together. Just go neutral onwalls and curtains and ask your kids to come to a shared agreement about accent colors. Carve out an individual space for each child. 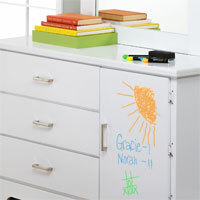 If an older sibling needs a place to do homework, consider a space-saving secretary desk. Place a comfy chair in a corne for a younger child’s reading nook. Just be sure each child has a space in the room— no matter how big—to call his or her own. Promote mutual respect. Have each child pick out a picture drawn by the other to have framed and hung over his or her bed. Be sure artwork from both children is displayed throughout the room. Furniture is surprisingly easy to divide. If you don’t have the space or budget to give each child his or her own dresser or bookcase, just be sure each gets his or her own drawer or shelf. Let them make it their own with colored shelf liners, fabric bunting, and other distinguishing décor. But think about it—kids out-imagine adults by miles. By letting them contribute to their room décor, you may solve some design issues and come up with a plan that appeals to both sets of style sensibilities. Here are a few tips for getting kids in the mix. Think of yourself as an interior designer and your child as your first client. Ask them how they hope to use the room—what types of activities might they do in there? Ask them what bothers them the most about their current storage systems and what they like best about their current room. Have them page through design magazines and tear out photos they like. Spread the pictures on the floor and try to find themes—common colors, patterns, textures, and styles. Take them to the paint store and let them pick out a color for their walls. You can limit their options to a handful of colors that you like, but allowing them to choose makes them feel like part of the process. Give them a piece of paper and some crayons and task them with finding solutions to your design problems such as lack of storage or an oddly shaped room. They just may inspire you with a solution!